The United Explorer Business card currently has an Informr score of 8.2 out of 10. This score is based on our evaluation of 8 sources including reviews from users and the web's most trusted critics. United Explorer Business card is typically available to those with good credit scores (650 or greater). Business owners who frequently fly United have a lot to gain from the United Explorer Business Card’s generous sign-up bonus and competitive rewards rate. A compelling card for anyone that flies United on a regular basis. The card has enough perks that this is a long term keeper. Because of its annual spending bonus of 10,000 miles, it’s a good card for a business that spends at least $25,000 per year. Additionally, employee cards are free, allowing business owners to earn rewards even faster. On tickets purchased from United. 2 miles for $1 spent on office supply stores. Earn 10,000 bonus miles once you once you reach $25,000 in purchases you. 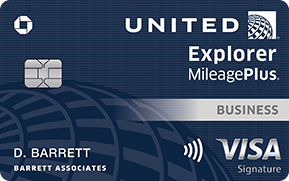 The United MileagePlus Explorer Business Card is an excellent choice for frequent business travelers who live near United hubs and have no problem remaining loyal to the airline. It’s doubly useful for those with reason to spend heavily in the favored non-airfare categories (restaurants, office supply stores, and gas stations) and those who can spend more than $25,000 in a calendar year. If you want a mile boost for business expenses, the Explorer Business card is for you. You’ll earn 2x miles on United ticket purchases. You’ll also earn 2x miles on gas, dining and office supplies. (Earn 1x miles on everything else.) What’s more, you can open a few employee cards if you need help accumulating miles. The best fit for the card is someone whose business expenses line up with the miles bonuses on the card. We also believe that those who want pre-flight perks like priority boarding and free baggage will enjoy this card.